And as a microcosm of the wider argument the little patch of land chosen for the embassy has its own bundle of complexities, sitting as it does in Arnona, now a mostly Jewish neighbourhood south of Jerusalem’s Old City. The site straddles the line between West Jerusalem and an area known as No Man’s Land, which was created at the end of the 1948 war between Israel and its Arab neighbours. One of those areas was an enclave between the Jewish neighbourhood of Talpiot and Arab villages to the east. The area remained a demilitarised zone until the 1967 Six Day War, when Israel captured the West Bank from Jordan, later expanding the limits of Jerusalem and annexing some of the Arab villages into the city. 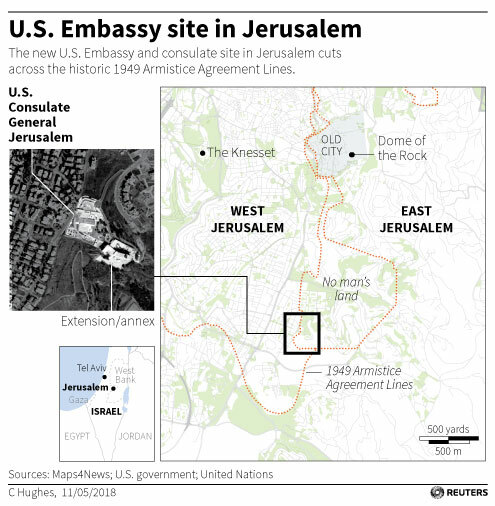 The move was not recognised internationally and the Palestinians continue to claim East Jerusalem, demanding that it should be the capital of a future Palestinian state. This was confirmed by a senior United Nations official, who was not authorised to speak publicly given the sensitivity of the issue. When Trump recognised Jerusalem as Israel’s capital he left the door open for Israel and the Palestinians to divide the city between them by stating he was not taking a position on “the resolution of contested borders”. That street was once the edge of Talpiot, a neighbourhood built in the 1920s by newly arrived Jewish immigrants and which housed such figures as S.Y. Agnon, the father of modern Hebrew literature and a Nobel Laureate in 1966.